A product with a rich history of applications and benefits, is none other than the wax used to make candles and crayons, paraffin wax. Though we are more accustomed to seeing it used in an industrial setting as an anti-caking agent, lubricant, and insulator, paraffin is also an incredibly versatile product that has many cosmetic and therapy based uses. Notably in the manicuring industries and as a panacea for those afflicted with arthritis and other rheumatic diseases. This brings us to the topic of this guide, paraffin wax baths. By using the intrinsic properties of the substance in the form of a bath designed to accommodate feet and hands, it is possible to combat joint issues and a host of skin related ailments. We have scoured the market for the best wax baths available, basing our estimation on important factors such as cost, design, and performance. We hope to make the task of buying a paraffin wax bath a less arduous task and hopefully provide some background on the hidden properties of this all too common, yet overlooked product. Paraffin is a flexible solid that is made from oil based products such as petroleum as well as coal. It has a white, almost transparent hue, has no smell and is flammable though it burns at a steady, reliable rate with less pollution than other combustible. A certain Karl von Reichenbach is credited with creating paraffin in 1830 when he attempted to break down and extract the wax-like materials found in petroleum, and more specifically slack wax, a residue of the refining process. Paraffin wax is most commonly used in candles. At the time of discovery, it represented a revolutionary new way of crafting slow burning, low cost, reliable and odorless candles, as opposed to the processed animal suet or fat previously used. The low melting point of paraffin was also beneficial to candle makers as it allowed it to fare better at lower temperatures in comparison to other similar products. Beyond industrial and other uses, paraffin wax has a host of benefits for the human body, most notably cosmetic and therapeutic. It is FDA approved so safe for use by humans in terms of physical contact with the skin. The basic principle of paraffin wax as a cosmetic tool is as a heat trapping agent and a natural emollient. In other words, paraffin traps heat that allows pores to open and naturally moisturizes the skin. This is particularly beneficial for those suffering from dry hands and feet as it allows the removal of dead skin cells and flushes out toxins. Once the dead skin is removed, the paraffin creates a protective waterproof layer that favours the gathering of natural oils found in the skin. These oils are crucial in ensuring hands remain well moisturized, glowing with increased skin elasticity and suppleness. Used in tandem with hand lotions, the results can truly transform the appearance of the skin on hands and feet. After using paraffin, the skin feels rejuvenated, softer, healthier and better equipped to handle the harshness of the weather and the cold. Paraffin works well on hardened skin as well, including calluses, notably on the heel, which is a very common issue that numerous people suffer from for years without trying to find a remedy. For these reasons, paraffin wax baths are a common sight in spas and nail salons, explaining the rise of the paraffin bath as a consumer product. In terms of therapeutic uses, paraffin is particularly well suited to ailments that respond well to heat such as arthritis, osteoarthritis and fibromyalgia. The heat encourages a better flow of blood to the affected joints as well as making them feel less stiff therefore increasing movement. It also loosens and relaxes muscles, reduces inflammation and swelling as well as generally reduces pain levels. Paraffin baths are often used in conjunction with traditional physical therapy practices to great effect by reducing symptoms. It also sets up joints and muscles to be far more responsive to rehabilitation and other forms of treatment. Sports related injuries also benefit, notably tendon and ligament issues due to strain or overuse. Treatment involves dipping the hands or feet repeatedly into a heated receptacle containing melted paraffin. The wax then attaches to the skin as it cools and hardens to provide the benefits listed above. Generally, multiple layers of paraffin are recommended. Once a sufficient number of layers have accumulated, the hand or foot is placed inside a plastic bag, sealed, then fed into a specially designed heat-conserving booty, or a standard towel. This allows the paraffin to have its full effect and provides a rather pleasing sensation that many users enjoy as a form of everyday relaxation. After keeping it covered for up to 20 minutes, the booty and plastic are removed and the wax is scraped off and returned to the bath for later use. Here are a number of features and options that characterize the majority of paraffin wax baths available to consumers. They are also a good indicator of the capabilities of the bath as well as a measure of the safety of the device. Paraffin melts at 125 F meaning sustained heat is required to melt the wax. In addition, depending on the maximum temperature a machine produces, the melting time varies. A higher temperature will melt it faster, while a lower one may take upwards of two hours. In line with the relaxing qualities of a paraffin bath, we feel that convenience is important and waiting too long to even start the treatment takes away from the experience. Variable temperature is also useful if you fancy a hotter or colder session. Variety is always recommended though this does come at a price. Different sizes mean different functions. Smaller baths are more suited to single hand dipping, while larger models are more geared towards feet and elbows. We recommend checking the size to make sure it is proportional to your needs as well as the size of your hands or feet. Many users are often disappointed to find that their hands aren’t fully submerged when using smaller models. Balance this out by keeping in mind that you need to store the bath somewhere. If space is limited, a smaller one may prove a more advantageous compromise overall. Dealing with high temperatures and a flammable liquid mean paraffin baths must have some basic design elements to ensure they are safe. These include a purpose built tank that is both insulated to retain heat and made of durable material to ensure the wax doesn’t melt through it after the first use. If you are buying on a restrained budget, we recommend the True Glow by Conair Moisturizing System. A compact little unit designed with price and convenience in mind, the True Glow offers 5.6 inches of width, length wise nine inches are available and the tub itself is three inches deep. 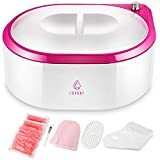 The dimensions are small compared to more expensive models, though this one works perfectly for those with small hands and as pre-manicure bath. The design is basic yet functional. There’s no temperature control so it’s a case of waiting around 90 minutes for the wax to melt, then turning it off and letting it sit for a while before starting treatment to avoid burns. It ships with one pound of wax infused with aloe vera to maximize the moisturizing benefits of the treatment. No bag or booty is included making it very much a DIY bath. We recommend the True Glow as a moisturizing unit, but not as a therapeutic one. The results are great given that paraffin, the central active agent, is used in the process, particularly on elbows and heels. The small size and limited features mean those suffering from more serious ailments than dry or uneven skin may not benefit much for using the True Glow. The True Glow is built well enough to support the high temperature and showed no signs of wear after we used it a couple of times. Not the best, but definitely a robust little bath. 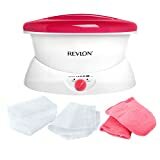 Higher up the price scale, we liked the Revlon Moisturizing Paraffin Bath for its features and the accessories provided. Larger in size than the True Glow, the Revlon is ideal for regular sized hands and feet so the whole area benefits from paraffin treatment. It melts wax in about 60 minutes according to official documentation, though some users suggest two hours is a more realistic estimation. The temperature control, though simple, works well allowing you to heat the unit sufficiently to melt the wax and also allow it to remain at a comfortable temperature once it has cooled down. The power on knob is self-explanatory and using the Revlon is as easy as it gets. The heater on button is also a nice safety measure. We really like that it ships with three pounds of wax as well as 30 plastic liners and two thermal gloves. You have everything you need to get going. We found that the Revlon allowed you to dip your hand in to just below the wrist so we can’t recommend it to those who suffer from wrist related issues. As with the True Glow is definitely sits within the cosmetic category. It works great to rejuvenate and moisturize skin, yet suffers in terms of providing medical benefits. In the same price range to the Revlon, we were also rather taken with the HoMedics ParaSpa Plus Paraffin Bath. Similar in size to the Revlon unit, it is 13 inches in length and 9.5 inches wide with a 6 inch deep tub. We found that regular sized hands fit easily though larger ones would have difficulty getting the paraffin to cover the whole surface of the hand. The attention to detail in terms of safety got our attention too. This includes a ready light that lets you know when the wax has melted and a lid with a safety locking mechanism to avoid accidental spillages. There is, however, no temperature control feature. The package contains the bath, 20 plastic liners and three pounds of paraffin. The lack of gloves is disappointing, but an old towel does just as well. Melt time is 60 minutes, though this is a best estimate and we recommend around two hours for fully melted wax. In line with the ParaSpa’s marketing, we concluded it was a cosmetic product that moisturizes hands, feet and elbows well, but provides little benefit for more acute joint issues. The low price makes it attractive for those wanting to improve the look and feel of their skin, but are realistic about it offering not much more than this. 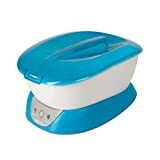 In terms of an all round contender that takes into account price and performance, we have to settle for the Salon Sundry Portable Paraffin Wax Bath. We were very impressed with this unit given the price. It is no doubt a premium product that drastically outshines the lower cost models. The design consists of a composite frame and inner grill, and an interior crafted with heat resistant metal. The grill ensures user don’t touch the bottom heating mechanism and the mechanism itself remains undamaged prolonging the unit’s lifespan considerably. The shape is functional and easy to keep clean, a blessing given the curves and indentations found on many other models that try to offer inventive, yet ultimately inconvenient, cosmetic flourishes. The 12 by 7 inch dimensions are large and easily accommodate all hand and feet sizes. The depth is equally sufficient to fully submerge both body parts comfortably so those suffering from ankle or wrist issues benefit from using the Salon Sundry unit. With six pounds of wax, the tub is filled to brim. With portability in the title, we were suitably impressed with the integrated handles that allow the bath to be moved safely, even when in use. The lid is see-through so you can check on the progress of the melting wax without having to remove it. Not a vital feature, but a convenient one. The controls are basic with just a power button and up/down adjustable temperature buttons. These worked well and we appreciated the clarity provided by the bright digital readout of the exact temperature of the wax. The ability to set the exact temperature and the highest temperature setting of 150 F allow for fast melting, as well as control over the heat sustained when submerging body parts for maximum comfort. Melt time varies depending on the amount of wax, though approximately 90 minutes is sufficient at max temperature. Controlling the heat means you can keep the wax in a liquid state for long periods of time, saving you the hassle of having to melt it down before each use. It also performed well when left on for long periods of time. Overall, we found that the Salon Sundry worked equally well in the home, salon and spa setting making it a versatile device. The only real downside is that it doesn’t come packaged with any accessories though these are readily available and low priced. We recommend it as both a cosmetic and therapeutic unit. It’s also recommended for beginners due to the clear and informative user guide that is included. Another contender in this category that caught our attention is the GiGi Digital Paraffin Bath. We liked it for its size and the control features that seem better than those found on similarly priced models making the GiGi a cost-effective option. The tank is large and made of steel allowing for full immersion with ease, though not on par with professional models. It is, however, enough to cater for home use without any issues. The see-through lid and locking system ensure spillages don’t happen if the unit is accidentally knocked or you need to move it for whatever reason. A removable foot base is also included, with a slanted angle so the foot rests without any pressure. The temperature controls include a digital display that shows the exact temperature. It can be increased or lowered via specific control buttons. There is also a quick melt feature that gets wax to a liquid state in around two hours if the tank is filled to the top, less time is needed for smaller amounts of wax. It ships with six pounds of GiGi Peach wax as standard. All in all, a good unit for the price given the temperature control and small, yet useful, additions like the footrest and locking mechanism. It comes well recommended by us. In a similar vein to the Salon Sundry with a few more accessories is the Lavany Paraffin Wax Warmer. We particularly liked the very fast melt time that stands at an incredible 20 minutes per two pounds of wax. The temperature controls, located on top of the unit for ease of access, are wide ranging and the heat markings useful. The preservation feature means you can keep wax in a liquid state throughout the day for multiple treatments, particularly useful in a salon setting. The lid is transparent so you can keep track of the wax meltdown. The size is large with a width of about 10 inches, a depth of 3.5 inches and a length of 7 inches. Hands can be fully submerged beyond the wrist and up to the ankle. 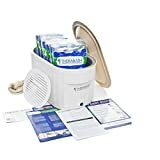 It ships with an array of accessories, including thermal gloves, 50 plastic liners, 600g of paraffin and an insulating grid. The paraffin provided is imbued with rose essence and the fragrance is soothing and adds to the treatment experience. The added accessories really round off this model and we like the features for their similarity to the Salon Sundry. If you want an all-in-one unit, this is your best bet. 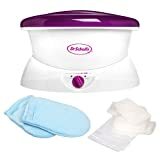 We picked the Dr. Scholl's Quick Heat Hand & Foot Wax Paraffin Bath as the best model for use with hands. 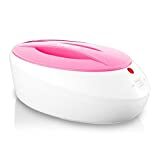 Features include temperature controls via a dial that allows the user to heat the wax then level down the heat to a comfortable level before putting hands in. The indicator light is basic, yet lets you know when the bath is operational. The inclusion of three pounds of wax, 30 liners and two thermal gloves rounds off the package. We liked the Dr. Scholl’s bath for the no nonsense approach that just works. There are no unnecessary features and we found the size, though limited, enough to comfortably insert regular sized hands without any issues. The price is also very attractive. Reconciling cost with performance is always a difficult task and getting it wrong can leave you feeling like you either haven’t got your money’s worth or the product simply isn’t good enough. In terms of wax baths, we found the LCL Beauty Deluxe Digital Paraffin Wax Bath to be the perfect all round unit. With very generous dimensions, the LCL bath has ample room for all shapes and sizes. Fifteen inch length, nine inches width and eight inches of height allow ankle and wrist-deep submerging with ease. The manufacturer states size 14 feet fit with no problem and we found this claim to be true. The tub size is simply astounding and we can’t recommend it enough for this feature alone. The fully digital controls are easy to use and the clear temperature display makes finding the perfect heat straightforward. The maximum temperature of 150 F ensure melting speeds are reasonable at 90 minutes or so, depending on the amount of wax inserted in the tank. The design and heat resistant metal interior also make sure the unit can run continuously without fear of accidents or overheating. The inner safety grill is a protective barrier between body parts and the heat source so burns and scalding are completely negated. Overall, we liked this unit nearly as much as the Salon Sundry and it comes highly recommended. 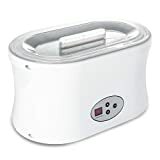 It also ships with 16 ounces of paraffin treated with a fresh spring fragrance, aloe vera and vitamin E.
The best paraffin bath that money can buy is without a doubt the Therabath Professional Thermotherapy Paraffin Bath. This is quite simply as good as it gets in terms of consumer paraffin baths available on the market today. The design is robust, to put it lightly, and constructed by hand with an anodized aluminum tub that is both insulated for heat retention and durable. It also weighs very little in light of its ability to run continuously in a safe and controlled manner. As well as the hand crafted element that ensures the bath works when it leaves the factory floor, the unit is also USA made, which adds another layer of reliability to the whole package. It also ships with six pounds of fragrance-free wax. In terms of capacity, the Therabath has enough space for up to nine pounds of wax. Dimensions are 14.4 by 7.8 inches and a staggeringly large 8.1 inches depth. You can cover your foot all the way above your ankle with ease at that depth. Few units offer even remotely similar submerging capabilities meaning you can provide relief for even the most far-reaching forms of arthritis effortlessly. Melt time is between six and eight hours though the Therabath is designed to run 24/7 negating the need for melting time in the long term. As such, there is no on/off function, simply plug it in to get it going. The temperature is set and two internal thermostats ensure the wax stays at a safe 126 to 130 F. This range is ideal because the wax is able to melt, yet submerging a body part will never result in burning. Essentially, this is the ultimate safety measure as the unit cannot hurt anyone. The lack of controls is not much of a disadvantage given the perfect temperature provided by the Therabath. The internal grill also puts a buffer between limbs and the heat source for added safety. Overall, the efficient simplicity of the Therabath warrants the high price alone. The huge dimensions and continuous cycle are great additions. It isn’t a model we would recommend to first timers or those who want an entry-level bath. We see it fitting perfectly in a spa or salon coupled with a high end massager, but also at home for someone who needs daily access and wants a hassle free, functional and reliable unit. It ships with six pounds of fragrance-free wax. If you are looking for a bath dedicated to therapeutic use, the Parabath Paraffin Wax Treatment Bath is the ideal unit in our estimation. It is specifically designed to help soothe the symptoms of arthritis, stiff joints and muscle pains caused by injury. It is versatile enough to handle hands, feet, and elbows. 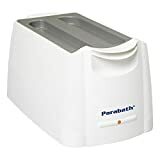 In a manner similar to the Therabath, the Parabath has an inbuilt temperature range of 126 to 134 F to ensure enough heat to melt wax, yet remain safe for use. There are no temperature controls so it is impossible to overheat the unit and it can run for long periods of time without any issues. Plug it in to activate it. Unplug it to turn it off. The stainless steel tub itself is large and deep enough to submerge body parts fully for maximum benefits. Dimensions come in at hefty 18 inches for length, 10.5 inches width and a massive 9.8 inches depth. The design is sleek and unassuming, yet very safety focused with a sturdy lid and sufficient weight to avoid accidentally knocking it over, perfect for therapy and sports injury treatment centers. It feels well-built and immeasurably more reliable than most other models. This unit is geared for healing and we felt from the get go that it oozed professionalism and the results we got from repeat dips were tangible. We highly recommend the unit for professional settings and for those wanting real respite from persistent ailments. The six pounds of wax included in the package are also a pleasing addition.